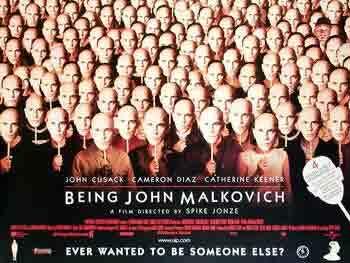 Being John Malkovich. Spike Jonez’ masterpiece was the best film of 1999. But what was most surprising is how well this erstwhile director of some great music videos (“Sabotage” by the Beastie Boyz and Weezer’s “Buddy Holly” are prime examples of Jonze at his peak, making gold in the craphouse that is music video by riffing off of 70s television) managed to keep a true line for all 112 minutes. The film blends physical comedy, greed, lust, existentialism, and celebrity in perfect parts, and it offers several of the more finely realized comic scenes in years. Moreover, the performances of John Cusack, John Malkovich, Catherine Keener, and Cameron Diaz are all strong and witty. Keener is especially effective as a remorseless sexual capitalist. Mary Kay Place and Orson Bean also turn in unique and hilarious supporting performances. The film is explainable, but I recommend against reading in-depth treatments of the plot, not because some great, dark secret will spoil the film for you, but rather, because the film is so audacious in content and presentation that prior explication could stifle the enjoyment. Suffice it to say that the title pretty much explains it. It is Jonez’ “Alice in Wonderland” and it is a work of genius.